Epic Mickey: Power of Illusion (also known as Mickey's Marvelous Adventure in Japan) is a side-scrolling platform game developed by DreamRift and published by Disney Interactive Studios for the Nintendo 3DS. It is the third game in the Epic Mickey series and it was released at the same time as its predecessor, Epic Mickey 2: The Power of Two in November, 2012. This game is touted as a tribute to Sega's Illusion series of Mickey Mouse games, particularly Castle of Illusion Starring Mickey Mouse. The game is one of the first third-party retail titles outside of Japan to be available as a Nintendo eShop downloadable, and the first to be available digitally simultaneously as the retail version. 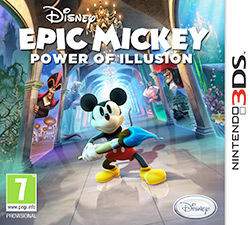 Power of Illusion takes place directly after the events of Epic Mickey 2: The Power of Two (according to the game manual). The evil witch, Mizrabel, and her Castle of Illusion have been accidentally transported to the Wasteland by the wizard Yen Sid. Oswald the Lucky Rabbit contacts Mickey Mouse to tell him the castle has mysteriously arrived in Wasteland and that Minnie Mouse has been spotted inside of it. Mickey then sets off to save Minnie and the illusions of other Disney characters trapped in the castle. This page was last edited on 9 October 2013, at 04:57.